Emily and Jackson Hiding Out by Phyllis Reynolds Naylor. The Companion to Emily's Fortune. Review: Have you ever liked old western fiction? Have you ever wanted to read dialect, action, and suspense at the end of every chapter? Then Emily and Jackson: Hiding Out by Phillis Reynolds is just the right book for you. The main character is a girl named Emily. It starts out when Emily, who has inherited a big fortune from her mother, escapes the mean clutches of her Uncle Victor who wants to spend it on himself. 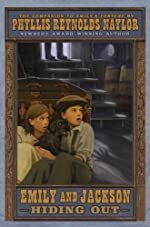 She goes to her nice Aunt Hilda's house with an orphan boy who helped her get away from Uncle Victor. She gets settled with her Aunt Hilda and one day goes to the bank to take some money out. But there's danger. They encounter the "Catchum Child Catching Services", and are asked if they have seen a boy who's supposed to go to work in a mill. Plus, Emily's mean Uncle Victor is up and about, trying to find a way to get Emily's fortune. There are a lot of exciting events along the way, and questions will be answered. Will Jackson be sent to the mill? Will Uncle Victor get Emily's 10 million dollars? Or will Emily and Jackson be safe? You have to read the book to find out. I like Emily and Jackson: Hiding Out because there is a lot of suspense; you can feel the excitement, and it ends in a cheerful way. After every chapter, there is a whole sentence of suspenseful words like, "And what in jumping Joseph do you think they saw?" or, "And what in the rooster's rompers do you think happened next?". It makes me think of the movies where it goes, *DUH-DUH-DUH! *, which I think is both humorous and a good way to end a scene. I also liked that it was a fairly easy book to read and it wasn't like those tedious nonfiction textbooks. I can't think of anything that was bad other than it was too short for me. Things happened a little too fast. However, other than that, this book is a good holiday read. I recommend it for anyone ages 7-9. We would like to thank Random House for providing a copy of Emily and Jackson Hiding Out for this review. Have you read Emily and Jackson Hiding Out? How would you rate it? Bill the Boy Wonder by Marc Tyler Nobleman. Review: Do you think you know who the creator of Batman is? Well if you guessed Bob Kane, then you would be wrong. Yes he did help, but Bill Finger wrote the Batman stories. Bob illustrated, Bill wrote. Bill had a tough life as a kid. His parents wanted him to become a doctor, but he was interested in art and writing. Journey through the rest Bill's life as you read this book. Bill The Boy Wonder was a quick read for me. It isn't very long and doesn't have much text on each page. It is not like any other ordinary book though. 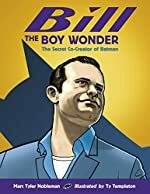 Bill The Boy Wonder is a biography about Bill Finger, written like a comic with illustrations from his life as pictures. That is how Batman started; Detective Comics. This book is very interesting and I DO recommend it. It's perfect for kids ages 5-10 for easy vocabulary. I give it a seven out of ten. Hope you like this book! We would like to thank Charlesbridge Press for providing a copy of Bill the Boy Wonder for this review. Have you read Bill the Boy Wonder? How would you rate it? Ambition's Not An Awful Word by Zack Zage. Review: "Oh, the moon left you this message 'It's ok to dream.'" This is a quote from the book I will be reviewing today which is Ambition's Not an Awful Word written by Zack Zage. It is a relatively short poetry book, and although I honestly didn't really like this book, I respect it and love this book's moral. Ambition's Not an Awful Word starts with a boy in class , Zack Zage, who has just been asked the question; "What do you want to be when you grow up?" The boy loves this subject and had answers various answers in a speech. Here are two pages from the book Ambition's Not an Awful Word. "If I were an artist, the critics all would flip. The bigs at New York's MOMA would cry, 'This guy's really hip.' From musicians by Picasso and the night skies of Van Gogh, to Da Vinci's Mona Lisa, and ME, a one man show. 'Oh your canvas is no Pollock. It is just a muddy mess.' Our teacher, Mrs. Grundy, thinks it's awful, more or less. 'You had better stick with finger paint, rubber stamps, and glue. 'Cause all that junk that you call are is really double doo.'" Now you're probably thinking, "Hey! What just happened? It just went completely from ambition to putdowns!" Well, yeah, that's what just happened. I can't really explain why, but he just puts himself down in all of his ambitious thoughts. This happens on every page. He'll be all excited about a career and on the next page thinks of every single possible letdown there is to that job. This is one of the main reasons I don't really love this book. In another page, he says he could be a banker; and a very successful one too. But then, on the next page, he says he'll go to jail because he would be so bad. Again, I think that is a big letdown. However, the end does make up for the rest of the book. The boy's mother does in the end teach the boy a lesson - and it's a very valuable lesson too. I recommend Ambition's Not an Awful Wordto parents reading this book as a story to younger kids anytime. It is not as interesting to older kids, but it does have a more sophisticated vocabulary. That is why I recommend it to parents reading to their kids. It also teaches a great lesson, which that is thinking you will be successful later on in life is very good for you. It encourages you to do better. In the end, although I did not particularly love the book, it does have a valuable lesson. We would like to thank Ivy Court Press for providing a copy of Ambition's Not An Awful Word for this review. 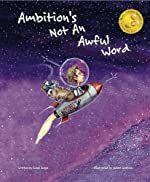 Have you read Ambition's Not An Awful Word? How would you rate it? Batman: The Revenge of Clayface by Eric Stevens. A Super D.C. Heroes Book. 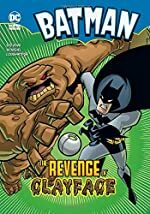 Review: If you are looking for a quick easy novel, Batman, The Revenge Of Clayface, written by Eric Stevens, is for you! In Gotham City, a new weapon is being developed when an evil villain wants to steal it right out of Bruce Wayne's hands and send it to a black market. If you like other DC Super Heroes, then this story about Batman will amuse you. Batman chases down criminals as Clayface plots his devious scheme. If you aren't familiar with these enemies the book includes a short glossary of some of the characters in the back of the book. I enjoyed this book even though it is short. It has colorful illustrations; and I like that it has a brief summary of information as a source for the characters in the back. It is a quick read and is interesting. The action and suspense of what happens next keeps you turning to the next page. It reminded me of some of my most favorite villains in previous Batman books. The only thing I didn't like about the book is that it is written for a younger audience with a lower level vocabulary. 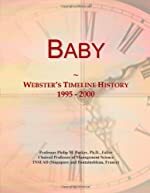 I would love to read a similar book for older readers. But, for the intended audience of younger readers, Batman, the Revenge of Clayface is an amazing book. We would like to thank Media Masters Publicity for providing a copy of Batman: The Revenge of Clayface for this review. Have you read Batman: The Revenge of Clayface? How would you rate it? Peanut by Ayun Halliday & Paul Hoppe. Review: Have you ever felt trapped by a lie that you told, or did you tell a lie to try to impress or make friends? 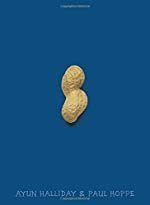 Peanut, by Ayun Halliday, is about a teenage girl named Sadie Wildhack whose lie turns into a disaster. Sadie has recently moved to a new school, Plainfield Community High School, and plans to make friends by getting attention through a lie. Unfortunately, her plan to lie about having a serious peanut allergy is not the best choice. Instead of telling the truth, Sadie builds on her lies with even more of them. This does not just affect her. It affects the whole school community. But, every time Sadie feels like telling the truth, she chokes up and finds a lame excuse. 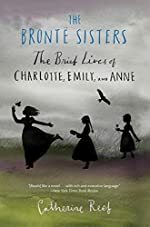 Even though Sadie does make quality friends, she lies to them, which only makes her fearful of losing them more and more each day that the lies continue. Will Sadie tell the truth, or will she suffocate from all the lies? Readers can relate to Sadie's problem since many kids have to start over and make new friends at different schools. Peanut is a good moral reminder to never tell a lie. Lies can all snowball into gigantic messes. As a teacher in the book says, "Next time you're tempted to bend the truth, take my advice and don'tÉ Sooner or later it will all come outÉ And then you'll wish you really had gone into anaphylactic shockÉ and diedÉ" This book is more appropriate for ages 12 and up due to the occasional mature subjects, hand gestures, foul language, romance, and cruelty. Besides that, readers will stay engaged to find out if Sadie tells the truth, and if she faces consequences for her actions. Ayun Halliday and Paul Hoppe deserve 4.5 stars for great comics, writing, illustrations, suspense, and for an overall amazing book. We would like to thank Random House for providing a copy of Peanut for this review. Have you read Peanut? How would you rate it? Review: Have you ever read a book about some thing very unusual but is fun to read? The story Flutter by Gina Linko is exactly like that. The book Flutter is about a girl with a special ability to mentally and physically travel to another dimension. Along the way she meets a guy named Ash and falls in love with him. I personally like reading about science fiction so I really enjoyed Flutter. It starts off a little slow in the beginning, not a lot happening, but then it picks up towards the middle of the story causing you to not want to put the book down. The main character in this story is Emery Land who is an 18 year-old girl that experiences what they call, "loops" or seizures where she travels to another dimension. Her father who is a scientist is always trying to figure out why she is having these loops. Emery gets sick of it and wants to live life like every body else. Because of this, she escapes to the town of Esperanza where she meets some interesting people. She meets one boy named Asher Clarke who known a secret that has gone on for years that helps Emery figure out why she is having her loops. Over all, Flutter is a very good book that gives a lot of suspense towards the end. Flutter has a very high vocabulary and strong language, which means it is most appropriate for readers age 13 and older because of the dialogue. I give Flutter a four out of five stars because it is very entertaining to read but the language was unnecessary and kind of made me uncomfortable. It gives so much detail about Emery's life that it feels like you are there with her experiencing every moment of it. All in all, if you are looking for a good book, check out Flutter. We would like to thank Random House for providing a copy of Flutter for this review. Have you read Flutter? How would you rate it? A Thunderous Whisper by Christina Diaz Gonzalez. Review: Touching, realistic, and heartwarming are three words that describe a historical and captivating story about a girl named Ani. She is just an insignificant girl who can't make a difference. That is what her mom has been telling her and she has started to believe as well. In the story titled A Thunderous Whisper, by Christina Diaz Gonzalez, Ani's life completely changes in just a small period of time. Ani lives in a small town in Guernica. 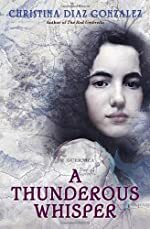 She is an unpopular, unimportant girl nicknamed ÒSardine girl.Ó Her father is the only person who has the ability to make her feel important, but he is off fighting in the Civil War. She is miserable and lonely, living in the small town. That changes when she meets Mathias. His father is part of a secret spy network. Ani and Mathias become part of the group, delivering messages to an underground resistance. Ani finally feels like she can make a difference. Then, one day, the Nazis bomb Guernica. Ani helps the survivors recover and take care of them. While doing that she gains a sense of her own strength. Ani is forced to move to England, but she and Mathias plan to continue to fight back as much as they can. I love this book! I usually do not like historical fiction books but A Thunderous Whisper made it super interesting. I like how they would have Spanish words thrown in at some parts. It made me feel like I was part of the book. It really helped to have the glossary at the end. I think that this book should be targeted towards people ages ten and up. It gives the reader a new sense of confidence and freedom and inspires readers to make a difference as well. I especially like that Ani stays strong throughout the whole book. Even when her mother is killed, she does forget her dreams. Although she is heartbroken, she continues to push on. Ani is a great example for all kids. Ani is encouragement to anybody who feels insignificant. She shows that even though she is in a horrible situation that it is still important to be strong. She pushes through all her fears and weaknesses. I give this book all five stars. They are well deserved. Christina Diaz Gonzalez is a wonderful author! We would like to thank Random House for providing a copy of A Thunderous Whisper for this review. Have you read A Thunderous Whisper? How would you rate it? Darcy by Whitney Sanderson. A Horse Diaries Book. 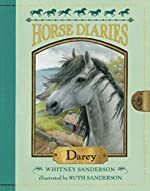 This book is about a horse named Darcy, who, at a young age, is torn from her small filly friend Ciara in an unfortunate accident. She is raised up by two mares, and is eventually auctioned off to a new family, the McKennas. After eventually accepting her new home, she bonds with her large family and learns the ins and outs of her new farm. After she meets the new rich family in town some 20 miles away, she can see that not all families are as nice as hers. She discovers her talent when she is put up against all odds, and is tested later when she is expected by everyone to fail. The McKennas however, keep their faith in the trusty old mare. Will her families encouragement, and the memories of late Òshadow sisterÓ Ciara be enough to help her defeat all odds, or will she let the pressure get to her? I think this is an awesome book, because not only does it keep you interested with quirky characters and interesting twists and turns, but helps you learn more about Irish culture and common horses in that area. This amazing book is both entertaining and educational. It's intriguing Irish dialect keeps you thinking, yet it is easily to figure out what the equivalent in English is. The title completely describes the book very well, and is not misleading. You can easily figure out what the book is about without being too predictable. The title fits the book perfectly because it is just like a diary, it tells about her own (Darcy's) life, and explains the other people in her life while expressing her own thoughts, opinions and feelings to the audience who is reading. Darcy almost engages the reader, by giving her opinion, but leaving you with her own thoughts with you to think about and try to understand with her. Having her own opinions and thoughts stated further intrigue readers, because many would want to confer with her imaginary character their own opinions and thoughts. When a reader feels welcomed or invited to want to agree, disagree or ponder about the actions or thoughts a character does or expresses, most will want to keep reading and will enjoy getting a chance to be so involved in the story. 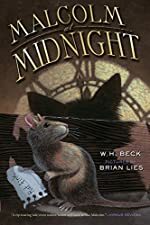 Overall, this is an awesome book with quirky characters, an interesting setting, beautiful illustrations and descriptions, and is a story that gets the reader involved. I would recommend this book to anyone who likes animal stories (especially fiction ones) or anyone who would just like to learn more about horses or Ireland. We would like to thank Random House for providing a copy of Darcy for this review. Have you read Darcy? How would you rate it? Sumi's Book by Jan Bozarth. A Fairy Godmother Academy Adventure. Review: What would you be if you could shape shift - a soaring bird, a swimming fish, or a slithering snake? Who or what would you defeat, if you were to conquer over evil? 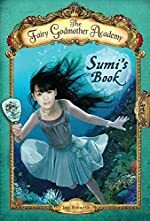 Sumi's Book, the fifth book in The Fairy Godmother Academy book series, is a captivating read written by Jan Bozarth. Sumi is an everyday girl who is all about fashion and her mother is a bit differentÉ ok more like a lot different! She can find the beauty in the very ugly, old things. It all begins when Sumi and her mom go shopping in an antiques store and Sumi finds an interesting box. When she opens it, she finds a mirror. She picks it up to look at herself, but when she looks, the glass is gone and she can't see herself. Sumi shows her mom what she has found and her mom takes it and says ÒThis mirror has special meaning for youÓ. Sumi is confused, she thought it was just a broken mirror, but she is wrong! Personally I think Sumi's Book is a must read. It has a lot of suspense, adventure, magic, and it's a thrilling story that teaches you to look on the inside of someone and not just the outside. Readers will find out that sometimes the ugly things (like dull gray fish) can be the most valuable. 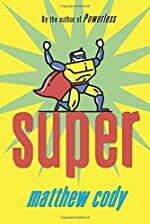 I recommended this book for kids in 3rd grade to 6th grade because it is a very easy read with only a few difficult words. Also, I would recommend this book more for girls because it includes a lot of talk about girl crushes and fashion, which would most likely interest girls more. I would definitely search for Sumi's book next time you go to the library and I recommend you read it! Review written by Karissa (th grade student). We would like to thank Random House for providing a copy of Sumi's Book for this review. Have you read Sumi's Book? How would you rate it?